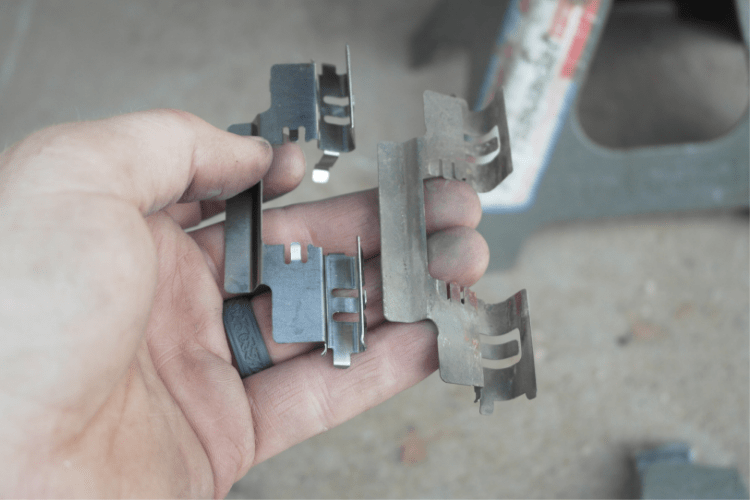 How to Change Brake Pads | Gold Eagle Co. It is inevitable that the day will come when you need to replace your worn out brake pads. The change interval varies greatly by the vehicle and how you drive and use your vehicle. The more you are in stop and go traffic, the more often you will have to replace your brake pads. A good example would be a family SUV like the 2013 Chevy Suburban shown in this article. It typically gets 40,000 miles out of a set of pads, whereas a postal vehicle will go through a set of pads every couple of weeks. The point is that you need to listen to your vehicle, because it will tell you when it is time to change the brakes. Every car with disc brakes has a tab on one pad called a wear indicator. As your brake pads wear down, the indicator will eventually touch the rotor, causing a squeal when you hit the brakes. If you don’t hear it or ignore it, eventually the pad will wear all the way down and destroy your rotor, leading you to a much more expensive job, not to mention the reduced braking performance. Once you hear the brakes grinding, it is too late. Don’t fret, however, as a brake job on most cars is just about the easiest thing to do outside of an oil change. You just need the right tools and a few tips. 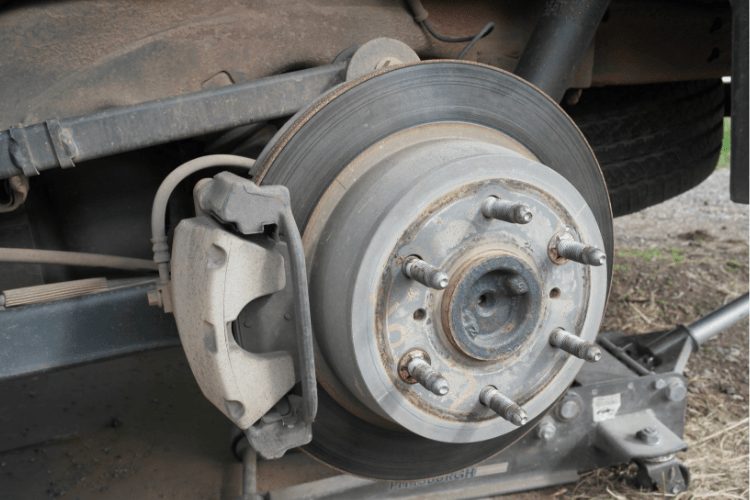 In fact, once you have the hang of it, you can knock out a brake job in less than 30 minutes. Some vehicles require an Allen or Torx bit to remove the caliper bolts, this varies by car. 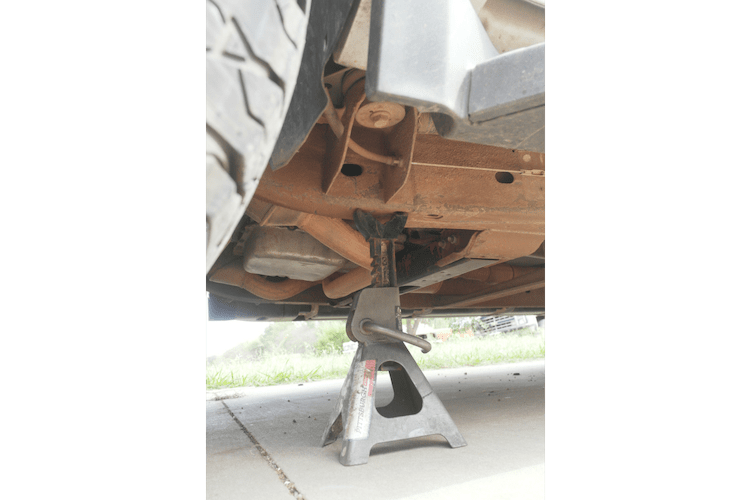 The most important thing you need to do when working on your vehicle with a wheel off is proper jack and jack stand utilization. Always lift the vehicle at a safe lifting point. Uni-body vehicles have pinch welds that are specifically noted for the factory jack, use it. If you are using a universal floor jack, then make sure you pick a safe point to lift that will not damage the vehicle and won’t slip off. Under the control arm or rear axle is a good place to start. NEVER work under a vehicle without a jack stand. NEVER. Do not skip on this step. If you do not own a pair of jack stands, buy them. 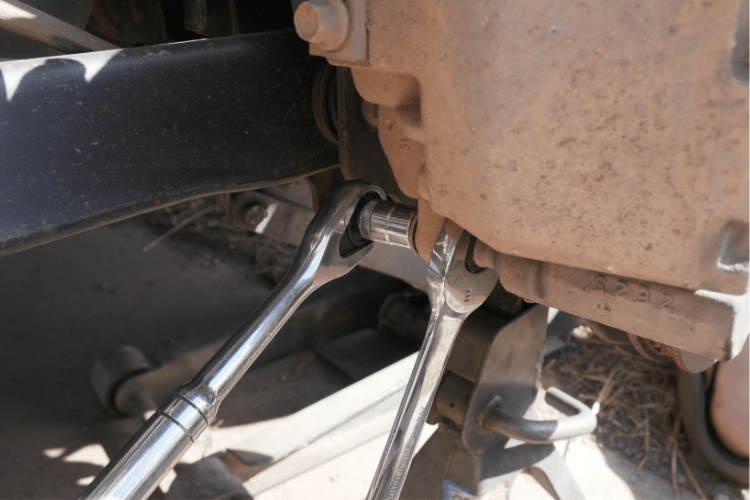 Place the jack stand in a safe location under the vehicle, such as the frame or suspension mounting point. Let the jack down so that the weight of the vehicle is supported by the jack stand. This is critically important. With the vehicle in the air (one corner only), remove the wheel. 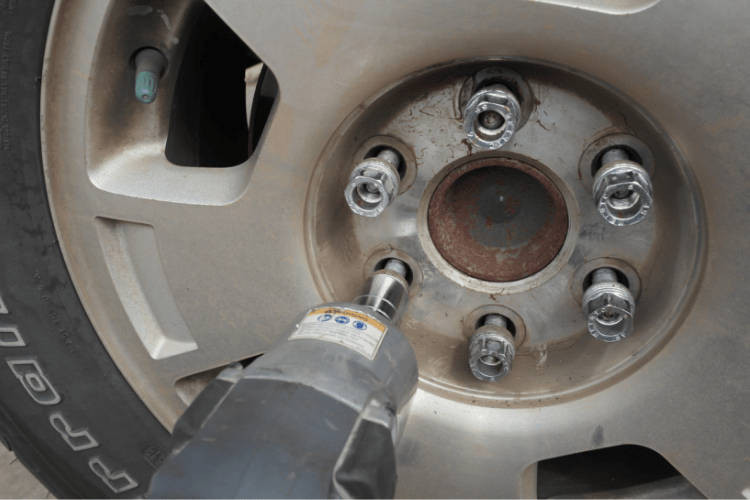 You may need to loosen the lugs, just break them loose, with the wheel on the ground, depending on your tools, or if the wheel is a free-spinning axle. 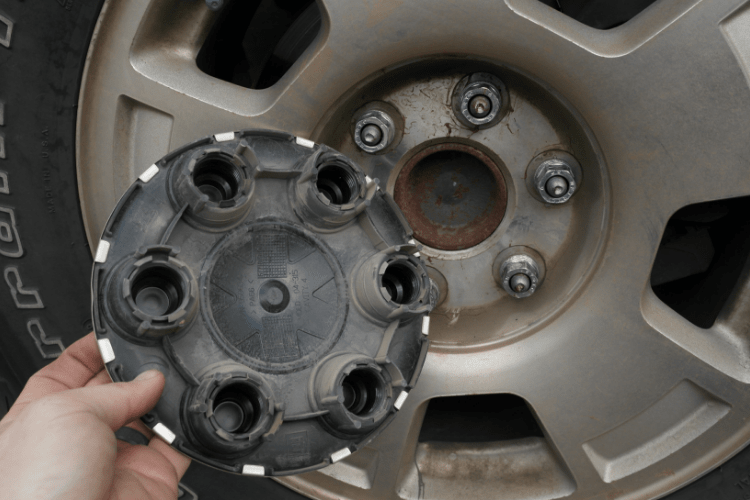 If the vehicle is in park or locked into gear, you should be able to remove the lug nuts with the wheel in the air. Once the wheel is off, you will be able to see the brake rotor and caliper. 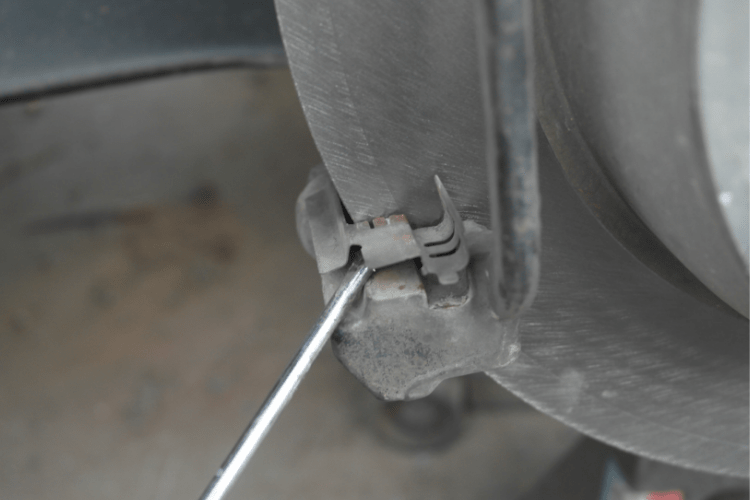 The caliper is the clamping mechanism that your brake pedal operates. 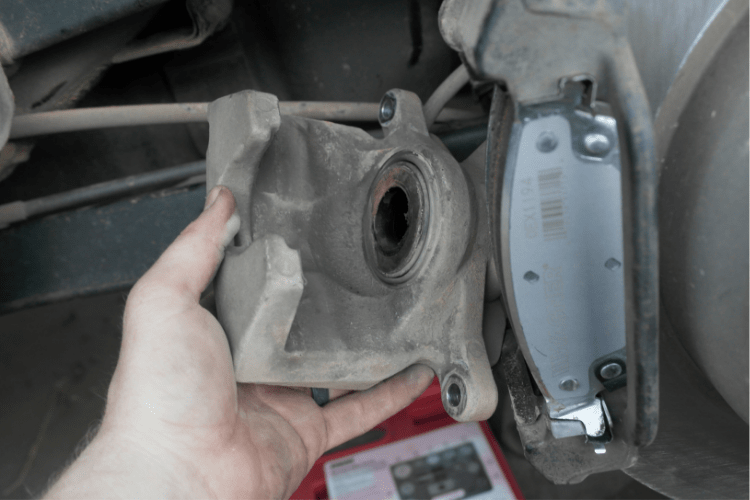 Most modern vehicles use a separate mounting bracket that holds the brake pads, but some calipers hold the pads on their own. This Chevrolet Suburban uses the separate bracket. There are two bolts on either end of the caliper that hold it to the mount. Remove these. 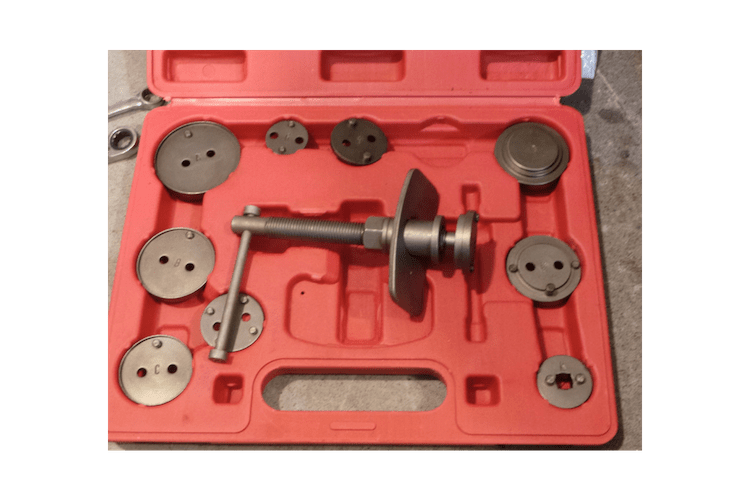 Some vehicles use Allen or Torx bits for this, so you may need to buy a special set. Gently pry the caliper off with a screwdriver. Place the caliper behind the rotor, you should be able to rest it on the suspension. Do not let it hang or twist up the brake hose, as that can damage it. Remove the old brake pads. You may need to use the screwdriver to pry them out. Then remove the retainer clips if so equipped. It is important to replace the clips, because they are wear items. Some vehicles have an inside and an outside pad, while some are the same. Make a note if they are different. Load the new clips into the mounting bracket, and then carefully install the new pads. You may need to pry them into place. Make sure you use the correct pad. Next we need to push the piston(s) back into the caliper. You can’t do this by hand, you need a special tool. There are a couple of types, and it depends on your vehicle. Some calipers use a rotating method, so as you press the pedal, the piston threads out. 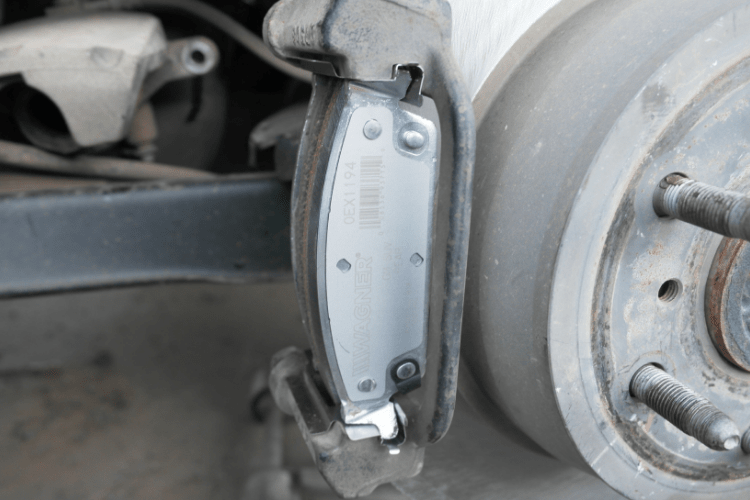 This is most common type rear caliper, when there is not a separate emergency brake. You need a special tool that has notches on it for this, and you use a ratchet to spin the piston back into the caliper. 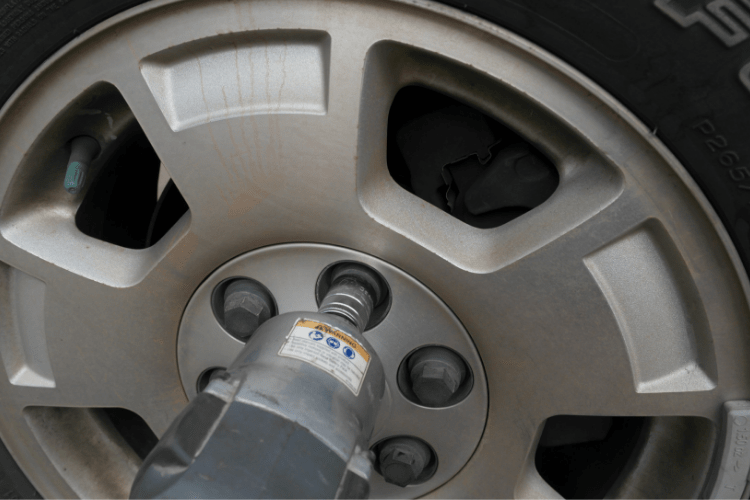 Most calipers use a simple hydraulic piston that slides in and out, as our Suburban uses. This type of caliper uses a compression tool to push the piston back into the caliper. This can be rented or purchased at just about any parts store. You can also use a C-clamp and a block of wood, but the tool is much nicer and easier to use. With the piston back into the caliper and fully seated, the installation is the reverse of the removal. Make sure you check the torque specs for the caliper. Reinstall the wheel and thread the lug nuts onto the threads. Tighten them enough to seat the wheel. Remove the jack stand and lower the vehicle to the ground. 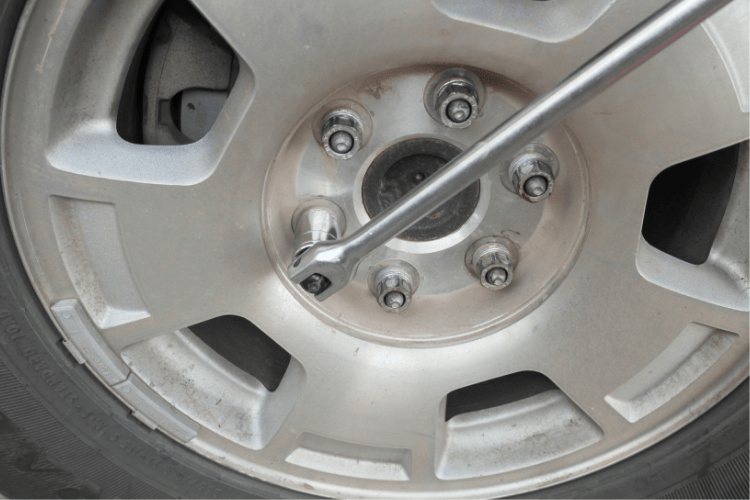 Use the breaker bar or lug wrench to torque the lug nuts in a crisscross pattern. Repeat for each wheel. The last step is bedding your brake pads. This will give you the most life from your pads. The basic process is to accelerate to 50-60, use moderate pressure to slow the vehicle to 30, repeat about 10 times. Drive a half mile or so to let the brakes cool, and then repeat the entire process 10-15 times. This removes any glazing, prevents new glaze from forming, and forms the wear pattern for the brakes. Hard stops or just driving as normal can lead to uneven wear. Don’t forget to check your brake fluid and top off with the correct fluid noted in your owner’s manual. 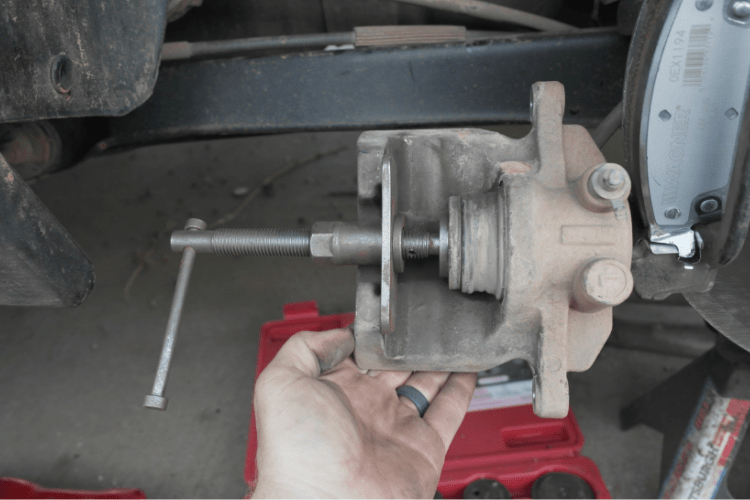 While changing your brakes is one of the easier jobs to complete at home, it’s always best to consult a mechanic for any additional tips and tricks related to your specific make and model.